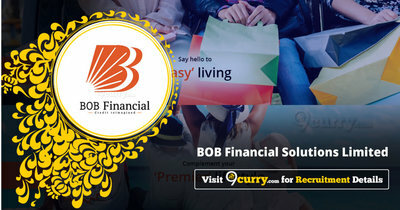 BOB Financial Solutions Limited Recruitment 2019 - Job notification for AVP Post – Telesales in BOB Financial Solutions Limited, Mumbai, Maharashtra, Delhi. Applications are invited by BOB Financial Solutions Limited (BFSL - formerly BOBCARDS Limited) on or before 20 Feb 2019 for 1 vacancy. Masters degree, preferably MBA with a specialization in Finance/ Marketing from a reputed college or university in India. 8 years of related experience in a leadership role preferably from Banking and Financial Services sector companies of repute. Previous experience in handling/heading Digital Sales would be favorable. Eligible candidates may Email to careers@bobfinancial.com with a subject as “AVP – Telesales” on or before 20 Feb 2019, along with the relevant documents.